Charlie Thomas is an extraordinary talent who has been with the Drifters for over 50 years. 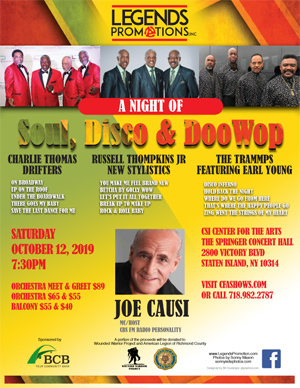 Fortunately, for the Rhythm & Blues and Doo Wop fans, Charlie Thomas keeps hits like "Under The Boardwalk", "Up On The Roof", "There Goes My Baby" and "This Magic Moment" along with countless other favorites alive for their audiences. Charlie Thomas, was inducted into the Rock & Roll Hall of Fame in 1988, will captivate their listeners for a truly memorable show. Earl Young is a 3 time Grammy winner and along with guitarist Norman Harris and bass player Ron Baker decided after playing on countless hits for the sound of Philadelphia, it was time for them to have their own hit record called “Zing With The Strings Of My Heart”. Earl brought in Jimmy Ellis, Stan & Harold Wade and later added Robert Upchurch and The Trammps were formed. Today the group consists of Earl Young, Antwon Young, Renny Rankins and Adrian Jackson. When the Trammps featuring Earl Young are performing every show is a party and they will surely burn it down. For over 30 years, Russell Thompkins Jr was the original lead singer of the Stylistics. His impeccable falsetto voice led the group to international fame and recognition. Russell's distinctive falsetto was the driving force and the backbone of the original Stylistics and it earned them: * (7) gold albums * (5) gold singles * (2) double gold singles * (8) platinum albums * (1) double platinum album * (4) platinum singles along with a Grammy nomination in 1974 for "You make Me Feel Brand New”. 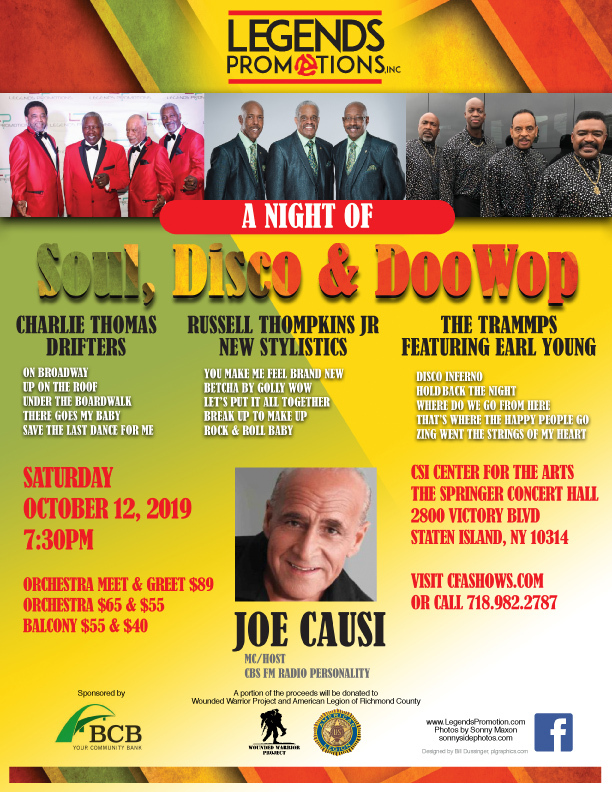 As Russell Thompkins, Jr. & The New Stylistics they are committed to delivering high quality vocal performances on stage and in the studio in a professional and masterful style. Also, in the group are Jonathan Buckson and Raymond Johnson. Their dedication, love for the music and contribution to the group makes them valuable member of The New Stylistics. Your MC/Host for the evening is WCBS FM Radio Personality, Joe Causi Sponsor by BCB Your Community Bank A portion of the proceeds will be donated to the Wounded Warriors Project and American Legion of Richmond County.